Vancouver metal outfit Anciients caught a lot of attention when they were long-listed for the 2013 Polaris Music Prize for their debut album “Heart of Oak”, a stoner-prog opus rooted in acoustic folk music. But despite opening for heavyweights like Lamb of God and Sepultura, they’ve only just completed their first Canadian headlining tour. I met up with vocalists/guitarists Chris Dyck and Kenny Cook (who was pulling double-duty on tour, playing guitar for openers Black Wizard) before their performance at Toronto’s Hard Luck Bar to speak about how word-of-mouth has benefited the band, their acoustic roots and love of grunge, and how they don’t fit in to the modern perception of prog music. In their home country of Taiwan, Freddy Lim and his band Chthonic (pronounced Thon-ik) are nothing short of superstars. They’ve twice now won “Best Band” at the Golden Melody Awards (the Taiwanese Grammys), and have worked with some of their country’s most notable musicians. They’re also known for delving into Taiwanese history on their albums and their outspoken politics in the region, pushing for independence for both Taiwan and Tibet. Freddy himself boasts a resume that would make Bono blush. He’s now in his second term as head-chair for Amnesty International Taiwan, he’s spoken at the UN, he’s met with the Dalai Lama, and he starred in a major dramatic film. Plus they teach his vocal technique in Taiwanese schools. When the band plays in North America, it’s not uncommon to see a group of middle-aged and elderly Taiwanese people burst towards the front of the stage when Freddy busts out the er-hu (that’s the two-string Oriental violin). There’s just one thing I haven’t mentioned: Chthonic are an extreme black metal band. Like their Norwegian counterparts, Chthonic’s international recognition has garnered them a lot of mainstream attention at home. It is amusing at times to see the places that Chthonic turn up, say rocking a professional baseball game with a black metal version of “We Are The Champions”. But as much as Chthonic have been inexplicably embraced by their country, they also take part in demonstrations against the Chinese government. Freddy had previously told me that he had received threats from some Chinese nationals on their last North American tour. Early last month as protesters in Taiwan were being blasted with water cannons, I spoke to Freddy at the Toronto stop of the “Paganfest North America Tour” about his impact at home, his relationship with mainstream culture, and why Chthonic even bothers to tour North America at all. The last time I spoke with frontman Nergal from Poland’s Behemoth in 2009, he told me that he wasn’t very popular in his home country. Unlike many of its neighbours, and despite producing some of the genre’s best bands, extreme metal music doesn’t seem as popular in Poland. Looking at an old appearance from a Polish chat show, Nergal seems at odds with mainstream culture, no matter how hard they try to understand him. But since then Nergal’s profile at home has exploded. Many have attributed this rush of interest to his relationship with pop-star Doda and his brief involvement with the Polish version of the TV talent-show “The Voice”. This seemed a bit absurd to me, as Behemoth’s music at its most accessible is undeniably extreme and utterly indigestible to a pop audience. At the same time it hasn’t always been easy. Nergal was twice brought up on charges of insulting the Roman Catholic Church for tearing up a bible on-stage, a crime with a maximum two-year sentence. As well Behemoth was put on hold in 2010 when he was diagnosed with leukemia. 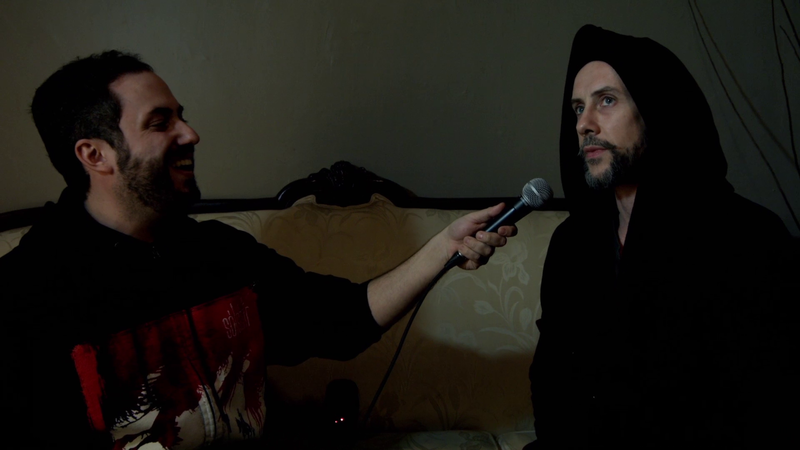 So it was with all this in mind that I sat down with Nergal before his Toronto headlining set on the Metal Alliance tour to talk about his increased profile at home, and the unique circumstances both bad and good that have made Behemoth one of the world’s most well-known and consistent extreme acts. UPDATE 05/26/14: Not long after the release of this interview, the band found themselves in trouble on their “Russian Satanist Tour”. They attracted attention from conservative Christian groups with some dates being cancelled. Apparently things did get physical at some stops. Finally in the city of Yekaterinburg, the band was detained for not having the correct visa. Seven members of band and crew spent a night in a narrow cell with feces smeared on the walls and were forced to urinate in bottles. The next day they were deported back to Poland. In the end, they were only able to play four of the thirteen Russian dates they had scheduled. Sabaton is a Swedish heavy metal band that has managed to gain a considerable cult following due to their lyrical content which revolves around the history of war, especially World War I & II. For instance they have a very passionate fan-base in Poland because of the song and subsequent video for “Uprising” (not surprisingly about the Warsaw Uprising of 1944). Writing about specific historical events has created a deep emotional connection with fans in the various nations that these events took place. At European festivals Sabaton often attracts crowds that rival the headliners, easily eclipsing their peers. They’ve also grabbed a few headlines in the past couple years by changing three of five members, and by releasing the album “Carolus Rex”, their first solely about Swedish history. I spoke with newer members Hannes van Dahl and Chris Rörland in Toronto after a set supporting Iced Earth, about joining a band with a huge passionate audience and how some people can get the wrong idea when it comes to historical lyrics.